Refer to Sec 627 for specifications concerning contractor surveying and staking. Additional guidance concerning contractor staking procedures are contained in EPG 238.4.27 Contractor Staking. The contractor’s surveyor is expected to perform the staking required by the contract. MoDOT surveyors are not to be used as back-ups if the contractor’s surveyors are unavailable. MoDOT will furnish the contractor’s surveyor with additional working points and benchmarks prior to the beginning of construction if needed. The contractor’s surveyor should make working points available to MoDOT upon request. 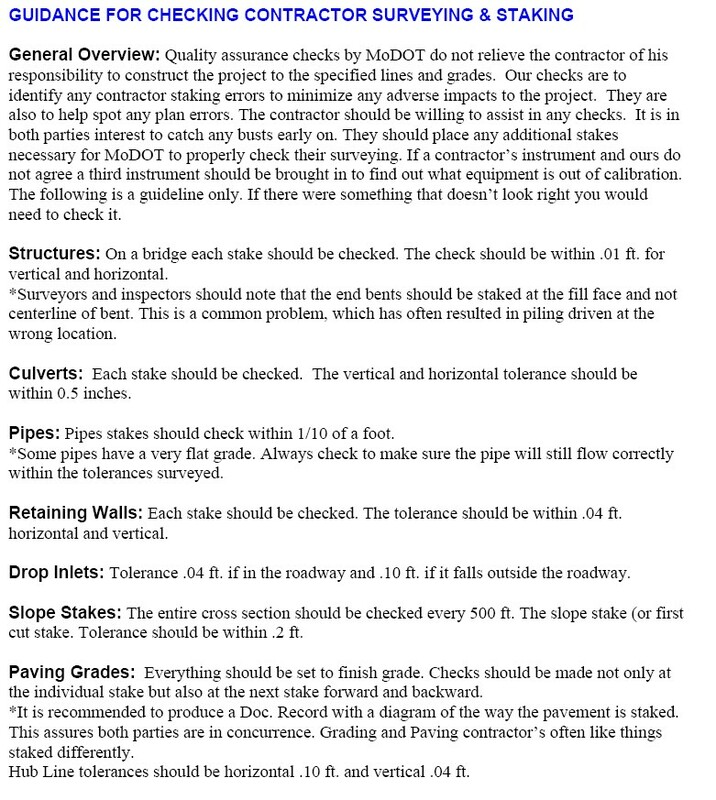 MoDOT will spot-check the staking of smaller structures, slope stakes and paving grades. General guidance on the frequency and tolerance of checks is found in the Engineering Policy Guide. If the contractors surveying is outside of tolerance they will be notified to correct in writing. The contractor is responsible for final line and grade of the end product. The contractor’s surveyor should provide enough information and staking upon request so MoDOT can adequately check the staking on the project. Staking the profile outlined in the specifications may not be required for each project, depending on the scope of the work. The clearing limits are generally marked 10 ft. beyond the planned slope line to allow for grading and the adjustment of slope-stakes to fit original ground. MoDOT will survey everything directly related to pay. The surveyor is considered a subcontractor with the same requirements of any sub with the exception of certified payrolls. This work is considered a non-regulated job so no prevailing wage rates are required. Utilities that may have to be staked should be done by MoDOT or should be considered additional work by the contractor and compensated. Quality assurance checks by MoDOT do not relieve the contractor of his responsibility to construct the project to the specified lines and grades. Our checks are to identify any contractor staking errors to minimize any adverse impacts to the project. They are also to help spot any plan errors. The contractor should be willing to assist in any checks. It is in both parties interest to catch any busts early on. They should place any additional stakes necessary for MoDOT to properly check their surveying. If a contractor’s instrument and ours do not agree a third instrument should be brought in to find out what equipment is out of calibration. The following is a guideline only. Check something that doesn’t look right. Structures: On a bridge each stake should be checked. The check should be within 0.01 ft. for vertical and horizontal. *Surveyors and inspectors should note that the end bents should be staked at the fill face and not centerline of bent. This is a common problem, which has often resulted in piling driven at the wrong location. Culverts: Each stake should be checked. The vertical and horizontal tolerance should be within 0.5 in. Pipes: Pipes stakes should check within 0.1 ft. Some pipes have a very flat grade. Always check to make sure the pipe will still flow correctly within the tolerances surveyed. Retaining Walls: Each stake should be checked. The tolerance should be within 0.04 ft. horizontal and vertical. Drop Inlets: Tolerance 0.04 ft. if in the roadway and 0.10 ft. if it falls outside the roadway. Slope Stakes: The entire cross section should be checked every 500 ft. The slope stake (or first cut stake. Tolerance should be within 0.2 ft. Paving Grades: Everything should be set to finish grade. Checks should be made not only at the individual stake but also at the next stake forward and backward. It is recommended to produce a Doc. Record with a diagram of the way the pavement is staked. This assures both parties are in concurrence. Grading and Paving contractor’s often like things staked differently. Hub Line tolerances should be horizontal 0.10 ft. and vertical 0.04 ft. This page was last modified on 9 June 2016, at 10:37.